If you can show up 15 minutes before your team's slot we will have everyone ready to go at the team time. The team photo will not be taken before the team time unless everyone is there. Individual photos may be taken early. Players should wear uniforms. No other equipment is required. No balls indoors. Players should bring all their equipment and wear tennis shoes. NO CLEATS! There will be indoor balls for the practices. No balls in the halls! I am hoping that the weather turns soon, or the MOT Football fields will never dry. We have the gym the following Sunday just in case. There are four clubs fielding teams at all levels in DYLA this year: MOT, Silverbacks, Brandywine and Smyrna. St Edmonds will be rotated into the schedule as will Hilltop (a startup club in Wilmington). Brandywine is making the Home/Away schedule. It looks like the Officials clinic will be on 3/24 and the regular season will start on 3/31 and run for six weeks . I will post home/away as soon as I have it. The gameday schedule should follow shortly. In the past we have tried to find other clubs to come to play so that every team played two games. This year we seem to have the largest turnout so far. The other clubs are still registering players, so we will have a team count by mid-March. On game day if we cannot schedule one of our teams for two games we will play a second game MOT v MOT. The end of season Jamboree will be on May 19. The 12U and 14U will play at DE Turf. The 8U and 10U will have an end of season event at Smyrna HS/Middle school. We will be using Bassetti Photography again this year. It looks like the date will be Thursday April 18. I know that this is the evening before the holiday break begins but we have at least two coaches who are High School coaches and we want them to be able to be in the picture with their team. That is the date that works best. The photo session is tentatively set from 6-7:30 and it looks like we will be at Appo High School. More to follow as details are finalized but please hold the date. I think that is it for now. I will be getting rosters to the coaches today, so they will be reaching out to you this week. (We need some more help with the 10U team if anyone is interested). I want to thank Mischele Lindsay for all the work she did to get the uniform order squared away. There was a lot of behind the scenes activity to make that happen. Next will be the team store so everyone will have a chance to purchase some gear with the new Lightning logo. Now that the season is getting ready to start, I wanted to post some information about how to recognize or suspect a concussion. Concussions in young players can potentially be serious if they go unrecognized, and the signs of a concussion can be subtle. This is a tool from US Lacrosse and I have shared with our coaches. 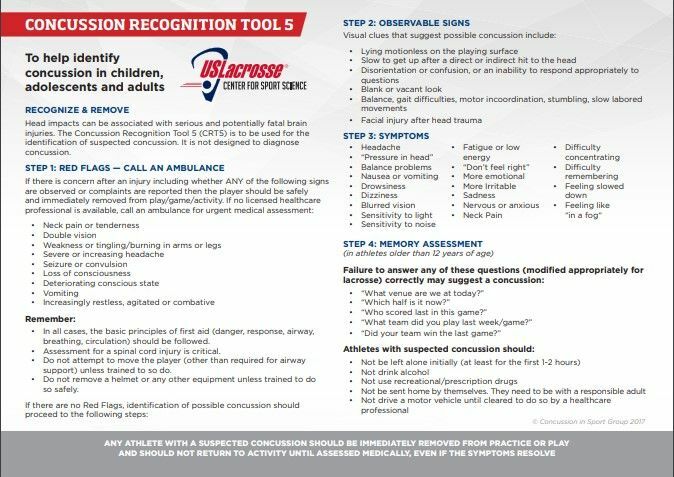 I am posting it so that as a parent, you may recognize a change in your player that could indicate a potential concussion. IMPACT concussion testing is available at Nemours AI duPont Hospital and through Delaware Orthopedic Specialists here in Middletown.